Some people would be surprised to hear that African grandmothers tell their grandchildren fairy tales that are familiar to Europeans – fairy tales that didn't come from books, but were passed down from generation to generation. When we hear these stories, we become reacquainted with Hansel and Gretel, and other characters from European fairy tales. In total, the author was able to find nearly 90 internationally known fairy tale figures who are the protagonists of Namibian fairy tales. In this volume, she presents 45 texts which she recorded and transcribed; a fascinating mixture of long-known material and its African adaptation where the European heroes have African characteristics. 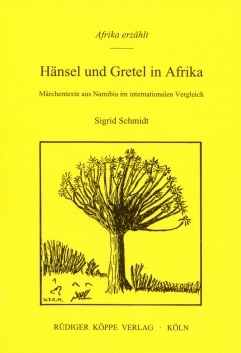 In the second and third sections, the author explores the question of how these fairy tales came to Namibia. She establishes that at least three dozen come from the Afrikaans oral repertory, which accompanied the South African Coloured to Namibia in the last century. In this way, Namibia has become the retreat of the oral tradition of these fairy tales, which tend only to exist in print in other countries. Through comparative research, the author shows that a number of versions of the same fairy tales must have coexisted at the Cape. She also gives evidence of the continued existence of Asian fairy tales from India and Indonesia in Namibia. Hint: Some minor folding on the spine.